Since we’ve been talking about travel bucket lists, I can’t help but reminisce about Spain, one of my favorite countries in the world. A few years ago, I returned with my entire family (with 17 month old Quincy in tow!) and traveled from north to south, enjoying pintxos, tapas, jamón, paella, and Spanish wine along the way. 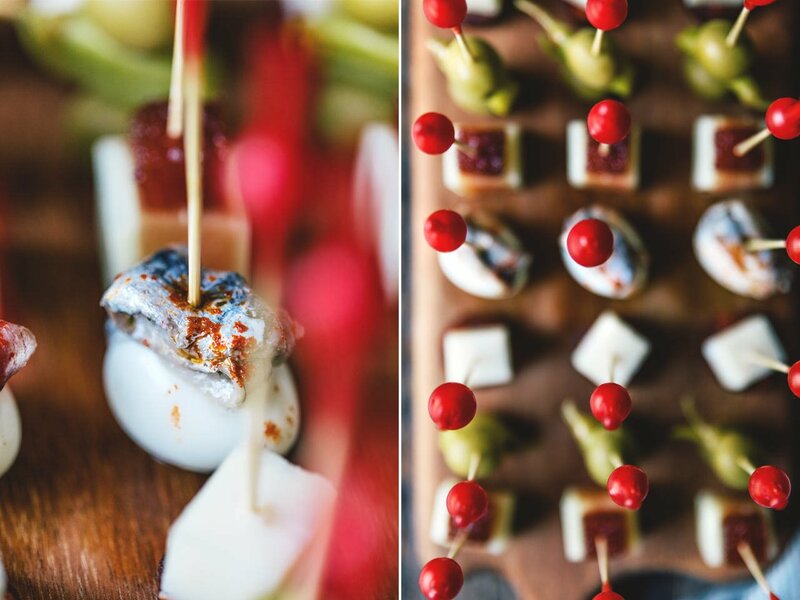 What are pintxos, you might ask? 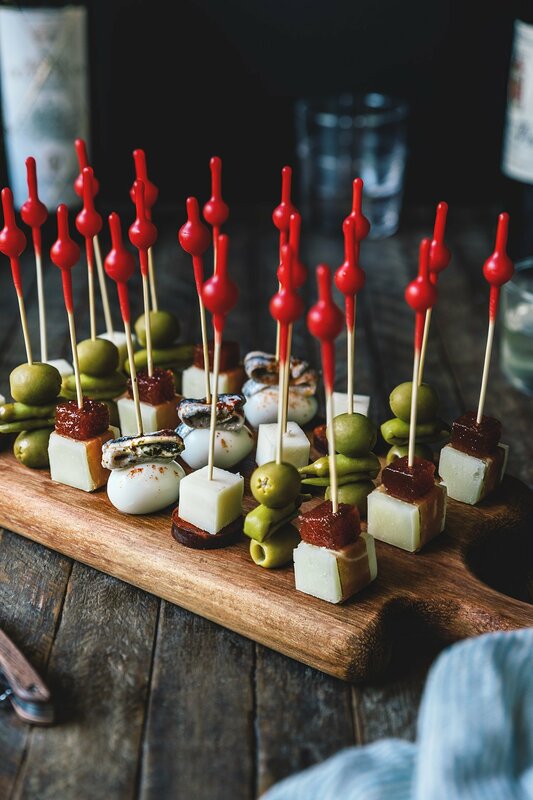 A pinxto, pronounced peen-cho and derived from the Spanish verb pinchar, is exactly how is sounds: a pinch of food that is pierced together by a toothpick. 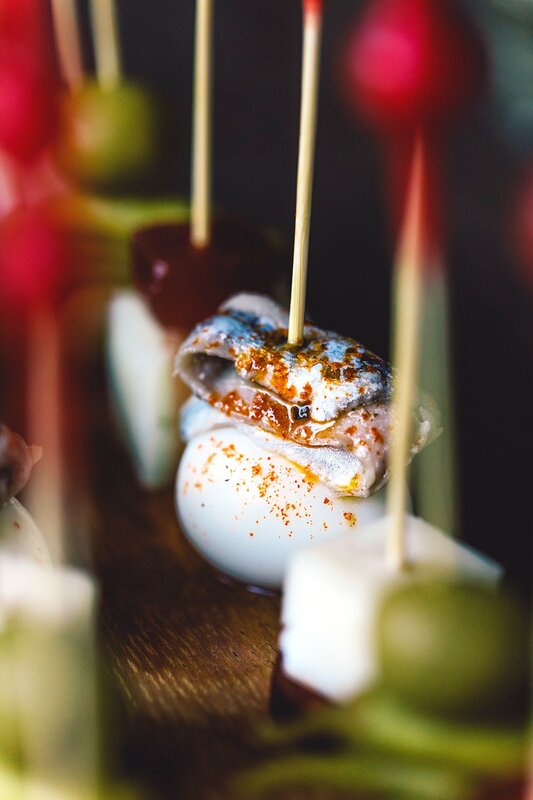 Hailing from the Basque region of Spain, the pintxo is essentially a smaller version of a tapa, however, they vary drastically depending on the town, restaurant or bar. Karen and I decided to recreate some of our favorite combinations, making them a bit more bite sized than you might traditionally experience in Spain. 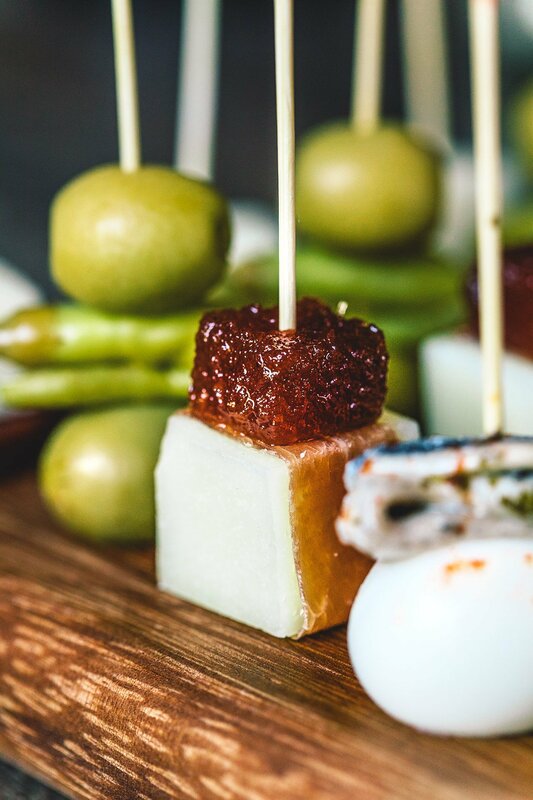 Some of our favorite combinations are fresh marinated anchovies with quail eggs, stuffed Spanish olives with Guindilla peppers and jamón and aged Manchego with quince. Devine. Although you can come up with any combination you feel inspired to create, I recommend visiting a local Spanish store to source your ingredients. It makes a world of difference. And stay tuned next week, where we’ll be sharing some more Spanish recipes! 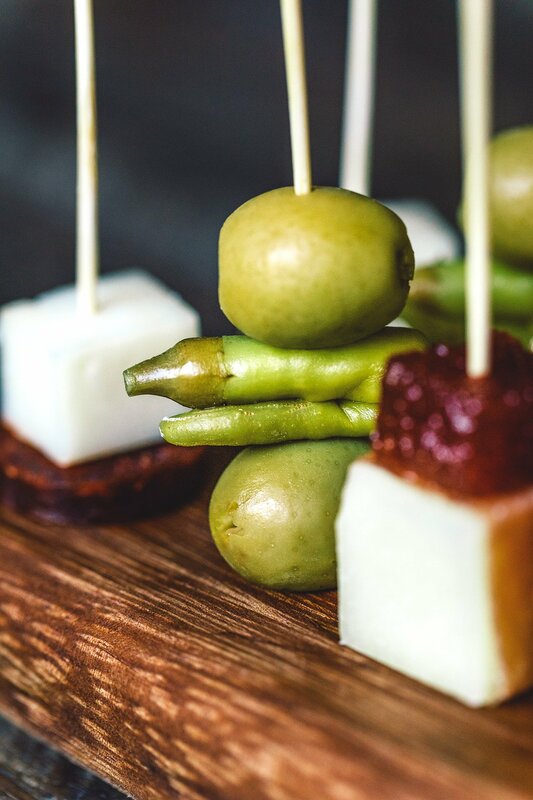 These small, Basque style bites are perfect to serve, along with wine, before a dinner party. These look so good! And where did you get those toothpicks! Aw, thanks Annie! We actually made the toothpicks!! 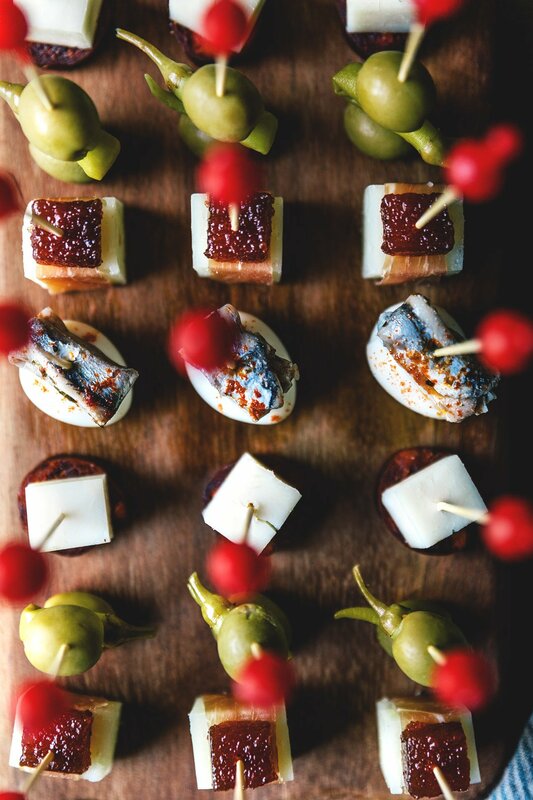 Being spanish myself, I have to say that tapas and pintxos are really such a great meal plan when hosting and enterteining at home! combination and possibilities are endles. Try to pair it with some “pa amb tomaquet” which is toasted sourdough bread rubbed with ripe tomato and the drizzled with olive oil. The cheese pintxos with the toasted bread are just amazing! These look absolutely fantastic. I love tapas and the entire concept of small bite fare. I cannot wait to try making these, maybe for the upcoming Super Bowl, maybe with a good Spanish Tempranillo…mmmm! !